Makes enough to ice a 23cm diameter round cake or a 20cm x 20cm square cake. Warm the jam with 1 tablespoon of water in a small pan. Press through a sieve into a bowl. Place the cake on a flat plate or cake board. Lightly knead 50g of the marzipan to soften slightly, then roll small pieces into thin sausage shapes and use to fill any gaps between the cake and the plate or board. Brush the jam over the top and sides. Roll out the remaining marzipan into a circle or square large enough to cover the cake (about 35cm for a 23cm diameter round cake or 20cm square cake). Lift it over the cake and ease down the sides to fit. Lightly knead the icing on a surface dusted with icing sugar. Roll out a 35cm circle or square, lift over the cake and ease to fit, gently pressing out as many creases as possible. Trim off the excess around the base with a sharp knife. Lightly dust with icing sugar then, using the palms of your hands, make a polishing action over the icing to smooth the surface as much as possible. For Gingerbread Cake : Marzipan and ice a 23cm round cake following the instructions, above. Using a narrow nozzle and a piping bag, pipe a zig-zag line of red icing around the top and allow to set. Thread together 10 decorated gingerbread people with ribbon and fix around the side of the cake. 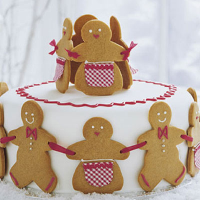 Tie four gingerbread people closely together and place on top of the cake. Position the gingerbread on the day you plan to eat it, as it will start to soften once exposed to air.